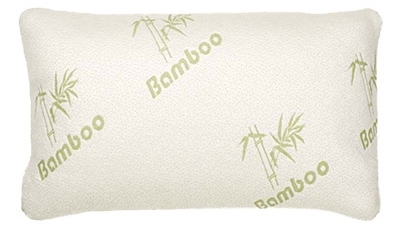 If you're looking for support and comfort, The Essentially Home Living Memory Foam Pillow with Bamboo Cover is what you’re looking for! Assisting with support of your neck and shoulders, and contouring around the natural curves of your unique body shape, this pillow is a must have for a peaceful night’s sleep. The removable Bamboo cover adds a breathable comfort to your rest and the responsive memory foam is great for back sleepers, side sleepers, stomach sleepers- whatever your preferred position may be! Wash outer cover only. Do not wash inner pillow.